I'm not posting forgotten books regularly anymore - I simply have run out of steam, possibly because I've forgotten any forgotten books I've read in the past. But occasionally, when I do stumble across one, accidentally or otherwise, I'll be writing about it - kind of on an irregular basis. In the meantime, don't forget to keep checking in at Patti Abbott's blog to see what forgotten (or overlooked) books other readers are talking about - most of them show up every Friday. I know I read Ngaio Marsh's FINAL CURTAIN a while back but damn if I hadn't forgotten who the killer was, not that that really matters much. Remembering would not have stopped me re-reading - it's all about the writing and the re-visiting for me. This is a particularly leisurely mystery as the first murder doesn't happen until well into the book and the second murder happens just a few pages before the end. As for the ending, it is a bit abrupt and not very satisfying, after everything that has gone before. But this is one of those books that you want to read regardless because Ngaio Marsh's gift for characterization and dialogue are absolutely topnotch and the setting is perfection, mystery-writing-wise. Here again we have murder at a large, foreboding, ungainly estate in the English countryside - something I am very fond of reading about. Ancreton is the 'family home' of the Ancreds - a very theatrical and fractious family at whose head sits Sir Henry, a famous and oh-so-egotistical Shakespearean actor now past his prime. 'Drama' is the Ancreds' middle name - they thrive on it, can't manage to get through the day without six or seven exhausting emotional scenes. Everything is a production. Everything has to be hashed over and over until there's nothing left but a morsel of the original idea. They are a wearisome bunch. And now that they are all gathering at Ancreton for Sir Henry's birthday, unpleasant things are bound to happen. Especially since Sir Henry has a habit of changing his will at the drop of a hat, depending on who in his family is momentarily in disfavor. Agatha Troy (known as 'Troy' to her hubby), the famous painter and wife of Scotland Yard Superintendent Roderick Alleyn is commissioned to paint a birthday portrait of Sir Henry in costume as MacBeth. She has been nervously awaiting the return of her husband who has been on overseas duty for MI5 (or its equivalent) during the war. They haven't seen each other in three years, so she's on pins and needles. Judging correctly that working will help pass the time that much quicker (Alleyn is due home in a couple of weeks), Troy arrives at Ancreton ready to paint. What she is not ready for are the constant battle royals and dramatic scenes involving Sir Henry and assorted members of his family, all of whom have arrived at the house to spend a few days. She finds Sir Henry a wonderful subject - though elderly, he is tall, handsome and dignified with a sweeping head of white hair - and the painting goes along relatively smoothly. The first third of the book is taken up with family drama and the feeling of impending doom, yes, but also with the how-to of portrait painting which I found fascinating. I'm very fond of painting minutia. But things can't help but go from bad to worse at Ancreton. Sir Henry has installed a young chippy of a gold-digging actress, the beautiful Sonia Orrincourt, and is making plans to marry her. Needless to say, this does not go down well with the relatives several of whom are in various stages of hysteria at the mere thought. When the very unfunny practical jokes begin early on, Troy realizes that something is seriously amiss. "A lamp, out of sight beyond the first spiral, brought the curved wall rather stealthily to life. Troy mounted briskly, hoping there would still be a fire in her white room. As she turned the spiral, she gathered up her long dress in her right hand and her left reached out for the narrow rail. She snatched her hand away with some violence and looked at it. The palm and the under surface was dark. Troy stood in the shadow of the inner wall but she now moved up into light. By the single lamp she saw that the stain on her hand was red. Five seconds must have gone by before she realized that the stuff on her hand was paint." By the time of the expected first murder, we know more than enough about the Ancreds' eccentricities and antagonisms to fill a volume. For me, the fun of this book lies in the family's day to day dramatics and the interaction between parties involved. 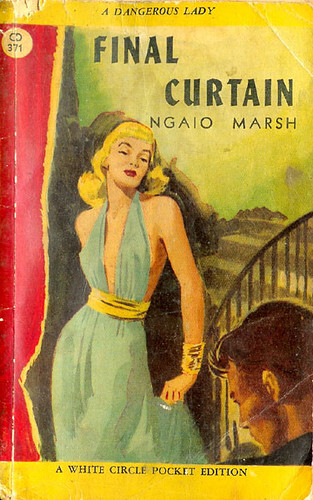 Ngaio Marsh creates two very memorable characters: the achingly swishy Cedric Ancred (the expected heir) who is persistently hard up for money - adored by his mother but abhorred by the rest of the family - and Thomas Ancred who is incapable of expressing himself without his mind wandering afield. Conversation with Thomas is fatiguing, to say the least. But oh, he makes you smile. It's fun to see how Troy and eventually, Roderick Alleyn (arriving home from the Antipodes to a murder involving his wife) deal with this frenetic and oh-so-very-British bunch. An excellent whodunit although in the end, you won't care that much about the 'why' of it. I will say though that if, like me, you love reading about voluble theatrical families given to grand gestures, this is the book for you. A book, by the way, which would make for a terrific play. Yvette, I love Marsh's books, and I thank you for reminding me of this one - it's been a while since I read it. I think Marsh was particularly good at writing about the kind of theatrical background which is present in so many of the books - in her "day job," she was a distinguished theater producer (the British term for what Americans call the director). I'm about due to re-read some of Marsh's better books - and I'll certainly add this one to the pile! I can't even recall how long it has been since I last read something by Ms. Marsh. I don't know whether to thank you or curse you for adding something else to my pile of "next" books. I haven't read a lot of Marsh (much more familiar with Margery Allingham) but this is one I have on my shelf as I love theatrical mysteries (when they're done well) - lovely review Yvette, thanks for that. I haven't cracked the nut of Ngaio Marsh yet. However, as far as classic mysteries go, I literally hummed as I got two Nero Wolfes, each with three stories in them -- and the piece de resistance, season two of the Maury Chaykin/Timothy Hutton TV series. Even my neighbor is watching them -- and she is not a mystery fan. But they are destressors and fun. Well as you know, Kathy, it's never a bad time to read a Nero Wolfe. :) But try and get your hands on a Ngaio Marsh or two.